We are seeking haiku which are relevant to the experience of urban and rural life in Australia. Observations that celebrate landform, seasons, and our unique flora and fauna, are welcomed. 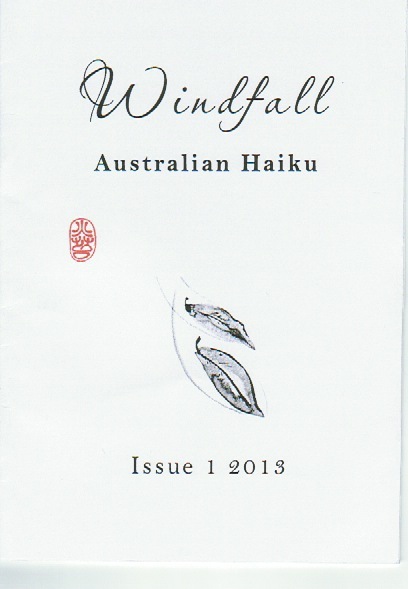 I was pleased to have two of my haiku published in the first issue, launched in Hobart in March. The Republic Bar and Café in North Hobart was the venue for the launch on 3 March 2013 of Australia’s newest haiku journal, Windfall. An audience of over forty people came for the regular Republic Readings, which this year moved from a monthly event to a seasonal event, the March readings being the first for 2013. This ensured a wide audience of poetry lovers, including and beyond readers and writers of haiku. The featured guest readers were Lyn Reeves and Tim Thorne who both read from their recent poetry collections. Between their two brackets, Robyn Mathison launched Windfall, praising its design and content and reading a selection of the haiku. Robyn commented on the distinctive Australian flavour and the variety of locations that inspired the poems, from the gritty Mallee to a sleepy Lismore Sunday to a camp in the Kimberley. She encouraged people to buy Windfall as a gift that could be easily slipped into an envelope with a card or letter, or to keep in a pocket or purse for reading at bus stops or in waiting rooms. Then those Tasmanian haiku poets who were present (Ron Moss, Lorraine Haig and Lyn Reeves) read their contributions to the journal. Ron read each of his twice in a row, which is what we did at Watersmeet Haiku Group and which was also a practice of Shiki. It felt very special to have all those involved with the publication of Windfall present for its launch: the publisher, Peter Macrow of Blue Giraffe Press; editor, Beverley George; Rob Riel (and his partner Judy Johnson) of Picaro Press who designed and printed it; and Ron Moss who contributed one of his beautiful drawings for the cover art. Hobart welcomed our visitors from interstate with splendid weather, and the audience welcomed Windfall with appreciation and healthy sales. At the launch, 55 copies of Windfall were sold with Lyn Reeves’ recent poetry collection, Designs on the Body, and Tim Thorne’s chapbook, Yes, No, also available for sale. This entry was posted in All posts, Lyn's writing, Uncategorized, Writing about Place - Competitions and Opportunities and tagged haiku, Lyn Reeves, Peter Macrow, publications. Bookmark the permalink.